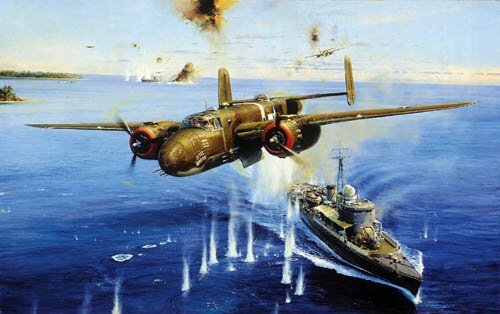 B-25 Mitchells from the 345th Bomb Group 'The Air Apaches' attack the Japanese Subchaser #39 off the tip of New Hanover Island, February, 1944. With the air full of tracer and flying shrapnel, a B-25 from the 500th squadron, 'Rita's Wagon', completes her run over the target. Having raked the ship with machine-gun fire, her bomb explodes near the stern, damaging the steering gear. Following closely behind, the next assault is about to start as 'Brother Rat' begins her diving attack, which will send the hapless subchaster to her destruction. Overall print size: 24" x 32"
Each print is individually signed by the artist and FOUR leading 'Air Apaches' pilots from the 345th Bomb Group.